The Omni William Penn Hotel has captivated guests with its striking beauty and its charming elegance since 1916. This historic landmark property has welcomed guests ranging from President John F. Kennedy to Billy Joel and from Bruce Springsteen to the Dalai Lama. Guests need not be celebrities to enjoy the ultra comfortable and completely renovated guest rooms featuring up-to-the-minute technology including high-speed wireless internet access and dual phone lines plus video check-out and personal voicemail. The hotel offers a variety of restaurants and cafes including the elegant Terrace Room featuring continental cuisine and the Palm Court with its traditional afternoon English tea. The hotel is surrounded by shopping and dining plus cultural and sporting venues and is only three blocks from the David L. Lawrence Convention Center. The hotel is adjacent to the Pittsburgh Metro System with links to all points of downtown and station square. Pittsburgh International Airport is just 17 miles away while Allegheny County Airport is only 10 miles away. Luxurious comfort embraces style. Hotel is 100 percent non-smoking. Brueggers Bagels: Located in the hotel lobby. Offers assorted bagels plus sandwiches and soups. M-F 0530-2000 hours and Sat-Sun 0600-1700 hours. Palm Court: The elegant Palm Court lobby offers traditional afternoon tea from 1430-1830 hours Monday-Saturday. Reservations for tea are recommended. Cocktails and light dining are served daily from 1130-midnight. Starbucks Coffee Cafe: Located in the hotel lobby. Serves premium coffee and pastries. Open Mon-Fri from 1530-2000 hours. Saturday from 0600-1830 and Sunday from 0600-1500 hours. The Tap Room: An English style pub-the Tap Room offers a taste of the Steel City featuring tavern style food complemented with a fine selection of beer-wine and spirits. A highlight is the best chili in Pittsburgh. Open Sun-Thur from 1130-1200 hours and Fri-Sat from 1130-0200 hours. Speakeasy: The Omni William Penn Hotel is proud to announce the Speakeasy-a sophisticated social lounge that whisks patrons back to the Pittsburgh of the 1920s. 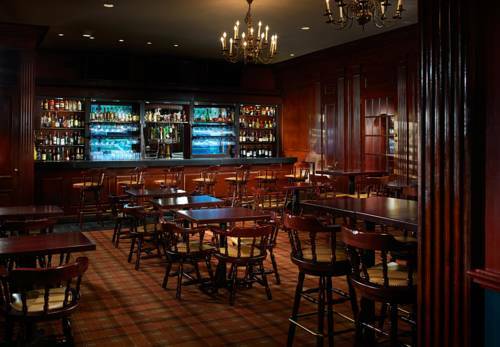 The Speakeasy serves guests and locals Tue-Thu from 1700-2300 and Fri-Sat from 1700-1230. The Omni William Penn Hotel is located in the heart of downtown surrounded by shopping and dining plus cultural and sporting venues. The David L. Lawrence Convention Center is three short blocks from the hotel while Heinz Field and the Pittsburgh Steelers, as well as PPG Paints Arena and the Pittsburgh Penguins Hockey Team, are just a short walk away. The hotel is adjacent to the T which is the Metro System which links all points of downtown Pittsburgh and Station Square. The hotel is only 17 miles from Pittsburgh International Airport and 10 miles from Allegheny County Airport. Pittsburgh International AirportCommercial shuttle service is available. Guests should call the company directly for reservations at 412-321-2648. Cost is approx. 19.00 USD one way. 36.00 USD roundtrip per person. The shuttle service is available daily from 0000-2359 hours. Shuttle service is located outside the baggage claim area. Pittsburgh City CenterNo free shuttle transportation to city center. Within walking distance to property.